These are interesting times for people obsessed with cryptocurrencies. For each type of cryptocurrency, there seems to be a battle going on to win the marketplace. I call it a battle because it sounds cooler, but it's just simple competition. Still, it will be interesting to know who will win in the end (and also profitable). Let's look at some of the cryptocurrencies on the market, where they fit in and who they are competing with. This is not an official categorisation, but the way I try to divide different cryptos into groups. There is a lot of debate about whether Bitcoin should be usable for making small purchases. My opinion is that Bitcoin was not designed for this purpose, but rather as a value container. Like digital gold. Other cryptos are much better suited for handling small transactions. So far, I haven't seen any great contender for Bitcoin in its category. Maybe Quantum Resistant Ledger could be a contender in the long term if quantum computing lifts off and threatens to break the cryptography of the Bitcoin blockchain. Bitcoin might not be suitable for small transactions, a lot of other coins are designed to take this role. Maybe the most famous one is Litecoin, which from the start had the goal not to replace Bitcoin, but to be a solution for smaller transactions. 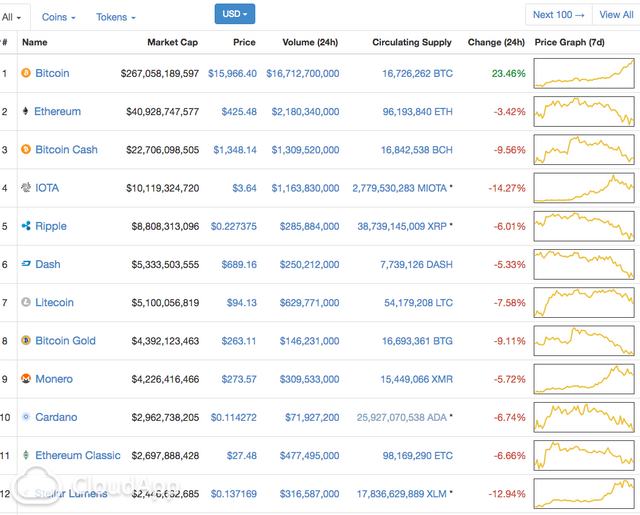 If you look only at market cap, there is a fight going on between Bitcoin Cash, Dash, Litecoin, DigiByte and Monero. But market cap doesn't mean everything, there are things like transaction speed, transaction cost, ease of use and so on. I think it's too early to tell who will win this fight. It's not necessarily the best solution that will win, rather the most well-known solution will win this battle. Litecoin and Monero have a bit of advantage on that front. A sub-category of this are the privacy-oriented currencies. Again, here you see competition between ZCash, Dash, Monero, Digibyte, PiVX and some others. Zcash seems to have a very strong team, but time will tell who will win this battle. For a while, Ethereum seemed to be the only serious platform for smart contracts and decentralized apps. But recently more and more contenders are joining the market. EOS, Cardano, Lisk, Stratis, Komodo, NEO, NEM, NXT and others are all claiming to be either the fastest, easiest-to-use or most secure blockchain for smart contracts. ARK takes a different approach by acting as a bridge between different blockchains. Ethereum has been facing some scalability issues, giving the opportunity for other solutions to profile themselves as the Ethereum-killer. There will probably be more than one winner in this battle while others will fade away. Personally, I think Ethereum is less developer friendly as other solutions and it should speed up its roadmap in order to stay relevant. Ethereum has some great features foreseen in future releases but they need to be production ready in time or others will step in and take a big share of the market. There are too many of these to mention and a lot of them won't survive for long. A specific purpose cryptocurrency is a technology design to serve a specific purpose. That purpose could be to be a decentralized marketplace for trading cryptocurrencies. Kyber, Binance, BitShares and some others are working on this. Or we can have very specific technologies linked to specific hardware, like IOTA. They are a category on their own and hard to compare with others. There are some promising projects that are token-based, like OmiseGo, SALT, Power Ledger, Metal, Civic and many more. They are not really competing with each other because they serve different purposes. What do you think about my categorisation? Did I forget anything important? keep in mind Litecoin is still up 53% in 30 days. That's not a bad return.